Along with the changing times this reverence to Mother Earth declined. Thus exploration changed to exploitation of nature leading to deforestation, untreated hazardous waste disposal and so on, that further lead to a vicious circle of destruction. We are severing the very ‘hand of nature’ that is protecting us. This creates an imbalance in nature resulting in disastrous natural calamities – tsunamis, floods, earthquakes, cyclones, famine, drought, avalanches, landslides…, the list continues. Can we ask, who is responsible for this? Can we ask why are we doing this? Can we predict the future of the forth coming generations, if there will be any? Now, the ultimate question – Who can restore this imbalance back? As and when nature is destroyed beyond repair, as and when nature’s fury strikes back – A Guru or an Avatar sets forth to guide humans to restore this imbalance. God wants us humans to unite and work as a single entity and undo all that we have done to nature. The Amala Bharatham Campaign launched by Mata Amaritanandamayi Math under the guidance of Satguru Mata Amritanandamayi Devi, lovingly called ‘Amma’ is an answer to restore this imbalance. 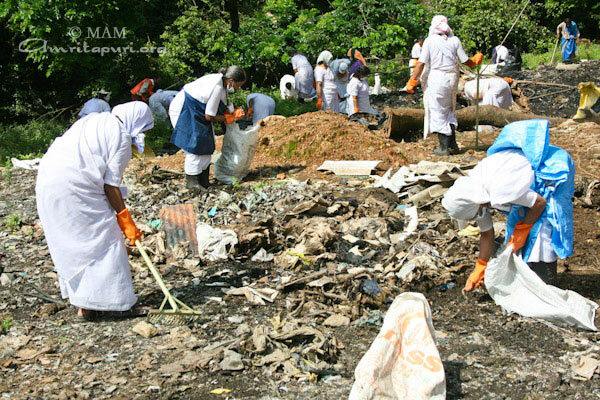 The year 2011, was no ordinary calendar year, it was the year when the Math organized and successfully executed several such campaigns with a Motto – Clean India, Beautiful India. 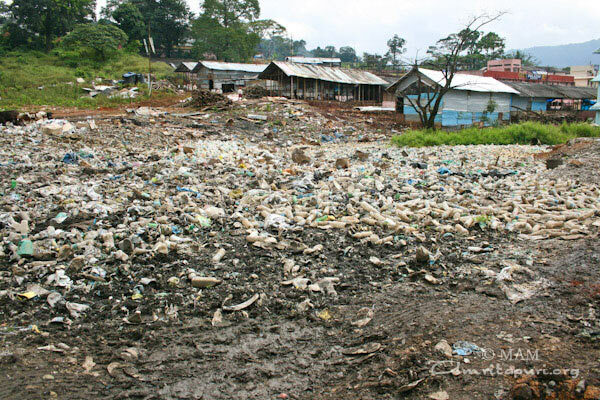 Mammoth qualities of waste was collected, recycled and reused. 4th November 2011 Ammas devotees from all districts of Kerala, Karnataka and Tamil Nadu meet at Pampa. 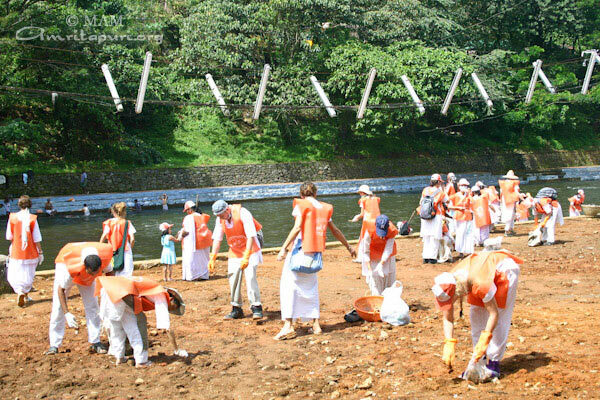 6th -7th November 2011 Students from various campuses join the cleaning effort at Pampa and Sannidhanam. 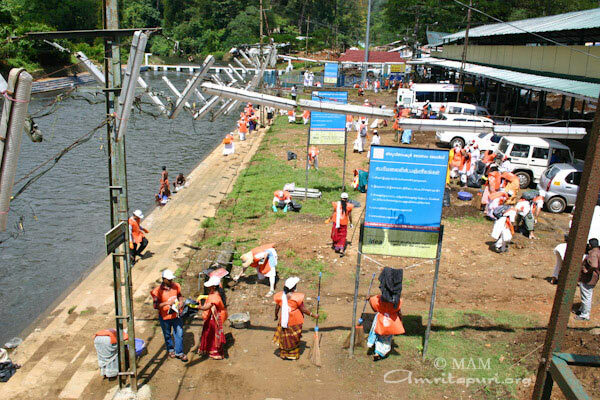 The vision and blessings of Amma, weeks of meticulous planning, collaboration with the government of Kerala lead to the advent of “ ABC @ Sabarimala ” ie Amala Bharatham Campaign at Sabarimala aimed at “Restoring the pristine beauty of Sabarimala”, the abode of Lord Ayyappa was announced. The entire campaign was executed across a span of 3 days – 5th to 7th November 2011. The pilgrim center was segmented into two geographical segments 1. Sannidhanam and surrounding areas and 2. The Holy River Pampa and surrounding areas. Each of these segments was further divided into sub-segments thereby enhancing micro management of all locations under the purview of ABC. Each section was assigned to one of the 12 groups. 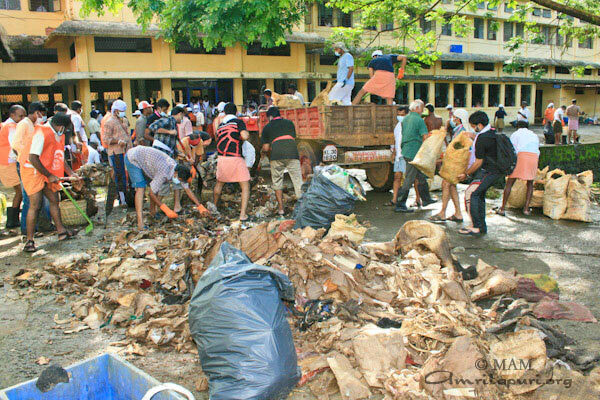 According to the intensity of the cleaning required in each area, 60 – 250 volunteers were assigned to work at a time under one group leader brahmachari. 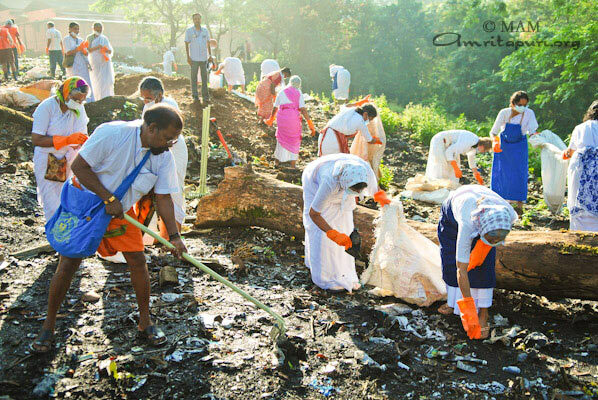 The volunteers included Ashram Residents of Mata Amritanandamayi Math, students from all the campuses (Amritapuri, Banagalore, Coimbatore, Kochi and Mysore ) of Amrita Vishwa Vidyapeetham, devotees from across Kerala, Karnataka and Tamil Nadu participated in this event. Love goes beyond boundaries. This event signified the same. 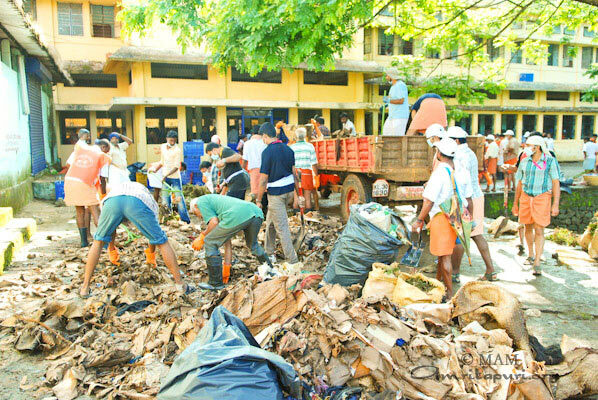 There were over 200 international volunteers who participated. Name a nation and you can get a volunteer, it was as close as this. Each volunteer was clad in their ABC attire – Orange coat, Orange gloves, Gum Boots and a broom or a basket or a shovel in hand. People from all walks of life, cultures, countries, languages and above all most inspiring different age groups, right from the age of 18 to the age of 80 plus all working under a single umbrella of LOVE. This mighty diverse army of volunteers worked for 3 days. 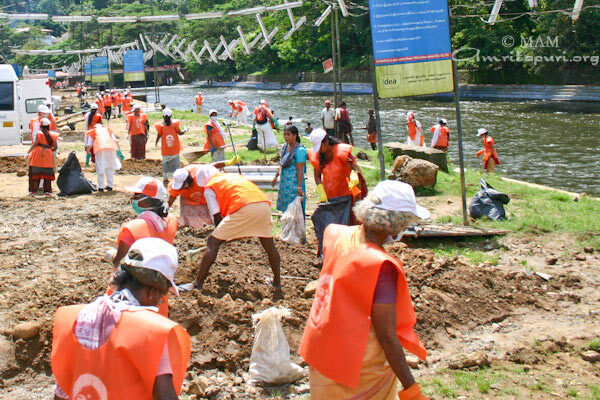 The entire Sabarimala seemed to be virtually carpeted ‘Orange’, with volunteers attempting to clean every creek and crevice leaving no stone unturned. To share an experience – a technocrat from the United States who was participating in the event, said it was the mantra, ‘Lokah Samastah Sukhino Bhavantu’ preached by Amma that had lured him to India in search of the Truth. “The British say, ‘God save the king.’ Americans say ‘God bless America.’ but Indians say ‘Lokah Samastah Sukhino Bhavantu,’ meaning ‘May all beings everywhere be happy.’ This sublime thought is the very inspiration of the thousands of volunteers taking part in the cleaning drive at Sabarimala,” he said. 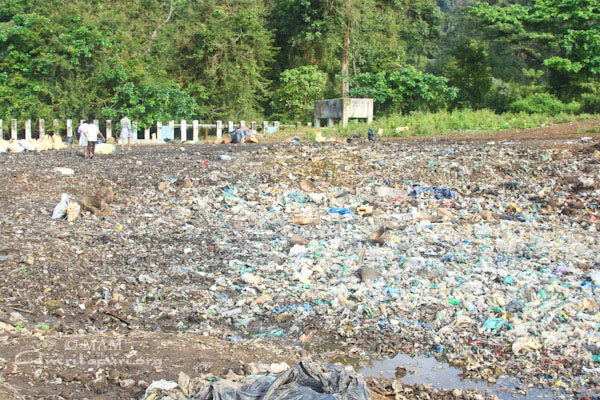 Another 62-year woman from the United States said it had been a wonderful experience to visit the holy hill and clean the filth accumulated in the surroundings of the temple pond. “I saw the Vedic maxim, ‘Tatvamasi,’ meaning ‘thou art that’ or ‘that is you,’ written in Malayalam atop the Ayyappa Temple. It was a Keralite friend who had read out the maxim for me, and I was impressed to know that it encapsulated the very philosophy of the Sabarimala pilgrimage,” she said. 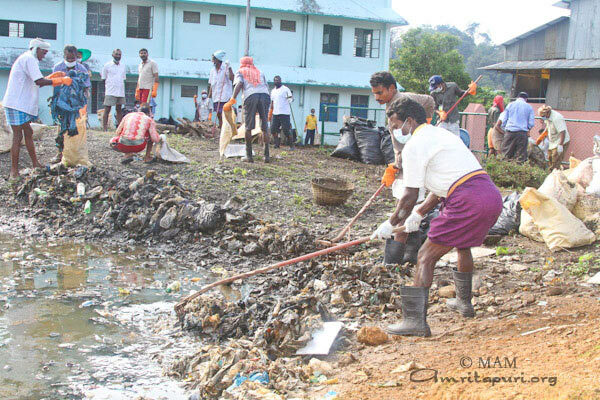 There were 15 tractor loads of brooms, gloves, recyclable waste bags, gumboots, spades, shovels etc that was carried from the Pampa river to Sannidhanam. The government of Kerala had sponsored 10 tractors for assistance and the remaining load of 5 tractors was shared among the volunteers. Even heavy loads feel light as a feather when they are divided and carried with Love. The result? More than 50,000 – fifty thousand – bags of waste was collected and segregated by the end of 7th November in a short span of just 72 hours. 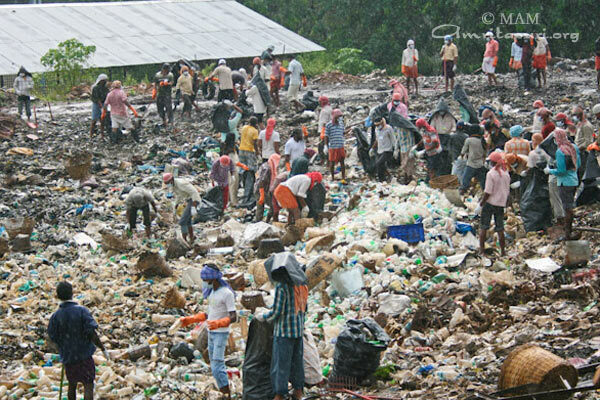 The surroundings of Sabarimala were no longer the same. The small rivulet blocked for long started flowing to Bhasmakulam again. The mountains started breathing fresh air again. Mother Nature was smiling again. The 7th of November a special function was held in Pampa. On this occasion, the Chief Minister of Kerala, Oommen Chandy recollected that Mata Amritanandamayi Math lead by Amma is there in the forefront for all major social welfare activities. The Finance Minister of Kerala, K M Mani congratulated Amma for having initiated the Amala Bharatham Campaign. He also expressed happiness that ABC had taken up the cleaning of Sabarimala. Minister Tiruvanjur Radhakrishnan thanked the ABC volunteers who had been inspired by Amma to participate in the Sabarimala cleanup. Devaswam Minister Sivakumar lauded the sincerity of the volunteers. 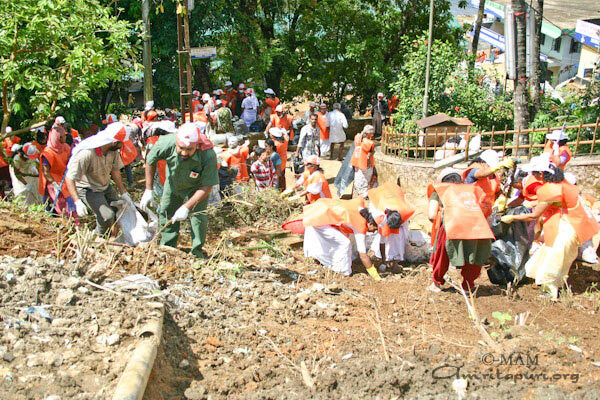 Recalling the initial meetings pertaining to the cleanup of Sabarimala, K. Jayakumar, Chairperson, Sabarimala High Power Committee, said, “When we asked for 500 volunteers, the Mata Amritanandamayi Math pledged to send as many volunteers as needed.” He pointed out that on the three previous days, 3,000 ABC volunteers had been involved daily in the cleanup activities. This event was not an event of cleaning externally alone. This event was an event where people were transformed internally as well. It was an amazing feat where octogenarians trekked uphill for 3 hours , worked for 3 days , trekked down for 3 hours and still kept smiling all throughout. None of the elements may it be rain, heat, dust, insects or even leeches could ever attempt to stop the power of ignited love in the hearts of the volunteers. This was a congregation of LOVE. This was a congregation for a cause. This was a congregation to restore the imbalance in nature. AMME SARANAM. None but only AMMA can do this. AMMAs unconditional love gives the motivation and energy to Her children. The Amala Bharatam Initiative lead by Amma is a remarkable message to the world. If we serve our Mother Nature one fold, she showers her blessings in many many folds. So let us take care of our Mother Earth, to our best possible extend. Such a task needs to be under a great leader who leads by example. We are really fortunate to have Amma as our leader and Guru, who drives us to participate in such great initiatives like Amala Bharatam.